Chief nurse Lorraine Szeremeta and colleagues with some of the nurse apprentices. A hospital trust in Cambridge is expanding its nursing workforce with more than 100 nurse apprentices. 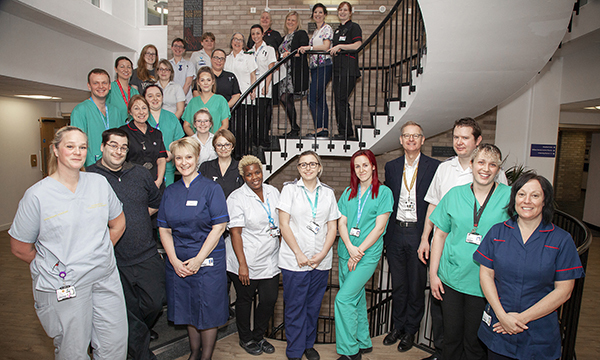 The Cambridge University Hospitals NHS Foundation Trust (CUH) has 105 nursing degree apprentices after embarking on a workforce plan to reduce its dependence on overseas nurses. It is working in conjunction with Anglia Ruskin University. CUH has set aside around £2 million after deciding to tackle the fact that 50% of its nurses were being recruited from overseas. The organisation anticipates it will spend around £500,000 each year on training and backfill costs over the next four years. It intends to have around 100 new nurse apprentices starting training each year. Chief nurse Lorraine Szeremeta said recruiting large numbers of staff from overseas was not a sustainable as each international recruit cost the organisation around £30,000. Ms Szeremeta believes CUH's cohort of nursing degree apprentices is probably the biggest in the country. She said: 'I think other organisations nationally will be looking to how we are achieving this because people are anxious about the costs [of training apprentices]. The nurse apprentices at CUH receive an annual band 2 healthcare support worker's salary of £17,460 and will continue to do so during the four years it should take to achieve NMC registration. Chelsea Booth had already worked at CUH for eight years when the opportunity to become an apprentice arose. Government plans for 1,000 nursing degree apprentices to enter training annually from September 2017 got off to what some might see as a shaky start. A nursing workforce inquiry by the Commons health committee in January 2018 found only 30 apprentices had entered training across the country and were confined to Anglia Ruskin University and the Open University. Health Education England confirmed 400 nurse degree apprentices had begun programmes in 2018.